September 2006 – Taipei, Taiwan – The upgrades to your computer are rendering your system hotter than before, and your outdated waterblock is just not helping. Do you want to upgrade your system thermal dissipation capability? Thermaltake Technology has been successful with the Heat Exchanger series last year, and continues to push for excellent products in 2006 with the Volcano Heat Exchanger 4008. Unlike most of the previous products, the Volcano 4008 emphasizes on the all-in-one aspect by combining the fan, the radiator, and the waterblock. When the coolant flows into the waterblock, the micro fins inside the waterblock brings the heat into the fins of the radiator built on top of the waterblock. The silent fan on top of the radiator then blows off all the hot air, maximizing the cooling potential of the Volcano 4008 unit. The Volcano 4008 can be used on mainstream CPUs such as Intel LGA775, P4, AMD AM2, K8. In order for consumers to easily adapt the Volcano 4008 unit onto their existing liquid cooling system, Thermaltake has included ¼” and 3/8” ID quick connectors. With these quick connectors, no one should worry about having a non-compatible unit with their existing liquid cooling setup. Thermaltake Technology’s Heat Exchanger Volcano 4008 is suitable for existing liquid cooling systems such as the BigWater 735, BigWater 745, and other high-end cooling kits. 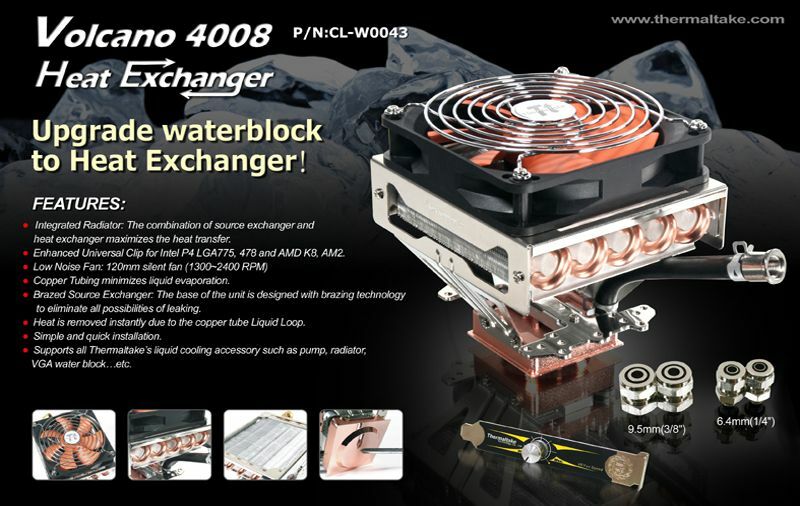 By upgrading your waterblock, you should never need to worry about heat dissipation issues for a long time to come.